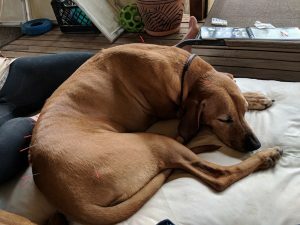 Alanna is an apparently healthy, 8 year old female spayed Rhodesian Ridgeback received 3 acupuncture treatments on April 27, May 5, and May 15 respectively. Myofascial examination consistently revealed mild-moderate sensitivity along the longissimus and iliocostalis muscles at thoracic vertebrae 9 and 10 bilaterally. Additionally, there was marked sensitivity along the right longissimus and iliocostalis muscles lateral to L4-L6. Palpation of the right iliopsoas muscle revealed marked sensitivity, whereas the left produced a relatively unremarkable response. The first treatment utilized 0.16x 30 mm Seirin needles over 15 minutes. Acupuncture points included GV 14, GB 21, Bai Hui, right BL 18 and right BL 21. The second treatment utilized 0.16x 30 mm Seirin needles over 20 minutes. Points included GV 14, Bai Hui, right BL 25, right BL 27, right BL 54, right GB 29 (which was reactive & not replaced), GV 20, right ~ BL 24, bilateral BL 23, and right BL 52. The third treatment was geared towards decreasing stress and included GV 14, Bai Hui and myofascial massage focused on the iliopsoas and associated muscles. There was not significant improvement in regards to patient reaction to trigger points or iliopsoas reactivity. This could be addressed by an increased number of treatments in a shorter time period, and addition of electrical stimulation or laser therapy to more effectively target the area. Due to potential correlation of iliopsoas pain and associated underlying joint pathology, a further diagnostic workup for associated joint involvement is recommended . There was a significant decrease in perceived stress during the second and especially third treatments suggestive of alternative benefits of acupuncture and massage. 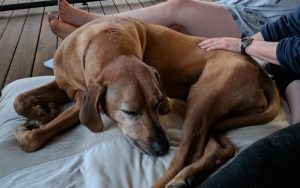 Alanna is an 8 year old female spayed Rhodesian Ridgeback. Alanna is presenting with no specific complaints and is apparently healthy. She is eating and drinking normally with normal urination/defecation and no vomiting/diarrhea/coughing or other concerns at presentation. She has a history of dislocation of her left second digit. After a brief course of NSAIDs and prolonged physical rest she recovered to normal ambulation without apparent associated pain. She eats Royal Canin GI Low Fat- 2 cups twice daily with Dasuquin and Welactin supplements for joint health. Her owner, a veterinarian, has noted some minor regurgitation occasionally and so feeds her breakfast/dinner elevated. Reported radiographs (unavailable for this report) were unremarkable and revealed no signs of mega-esophagus. Environmentally, Alanna lives with her half-brother who occasionally likes to play rough occasionally at home. They go for walks daily and have access to a fenced yard. Alanna is active but has started to slow down a little in the last few years. General: Bright, alert, responsive. Excited. Cardiovascular: Normal rate/rhythm. No murmur noted on cardiac auscultation. Femoral pulses strong/synchronous bilaterally. Respiratory: Normal rate/effort. Normal lung sounds bilaterally. Dental-GI: Mild dental tartar on oral examination. Soft and non-reactive to abdominal palpation. Digital rectal examination not performed. Musculoskeletal: Good skin and hair coat. No abnormalities noted on ambulation. Neurologic: Normal mentation and ambulation. Normal proprioception. No pain on spinal or cervical palpation. Intact palpebral and perianal reflexes. Normal menace. Myofascial examination consistently revealed mild-moderate sensitivity along the longissimus and iliocostalis at thoracic vertebrae 9 and 10 bilaterally. There was marked sensitivity along the right longissimus and iliocostalis muscles lateral to L4-L6. Palpation of the right iliopsoas muscle revealed marked sensitivity, whereas the left produced a relatively unremarkable response. Ultrasound to elucidate extent of iliopsoas muscle/associated tendon strain would be recommended but was declined/unavailable at the time. Consistent myofascial and musculoskeletal examination findings of sensitivity associated with the attachment points of the iliopsoas muscles (primarily L4-7) and reactivity upon palpation of the iliopsoas muscle itself are suggestive of iliopsoas muscle strain. Based on a lack of evident heat, swelling, or lameness in the associated hind limb and joints and no specific history of trauma, low grade chronic strain is highly suspected. Further diagnostics would rule out chronic iliopsoas pain secondary to compensation for associated joint pathology. In all treatments, I started with centrally located points which target specific areas based on my myofascial examination. Needle placement throughout the body ends up affecting the local muscle spindles directly and the connective tissue which can have a broader effect including tendinous attachment. Some of the desired effects include decreased inflammation which is often associated with muscle or joint soreness/pain. Additionally, increased blood flow and upregulation of the immune system in response can have a positive effect on repair and healing. The determination of which points, and in what sequence can be found below. The last treatment heavily relied on massage, which can help reduce cortisol and stress. This was the primary goal of the final session. Some other benefits of local massage are that it can assist with tissue repair and increase blood flow and circulation . These local effects were why I focused on the affected areas identified on myofascial examination. The iliopsoas muscle consists of the psoas major and the iliacus muscles. Due to its insertion point on the lesser trochanter of the femur it can be difficult to palpate fully and treat directly. The psoas major muscle originates from the transverse processes of L2 and 3 as well as the bodies of L 4-7. The iliacus muscle originates from the ventral ileum. Based on myofascial examination findings and anatomical attachment points of the iliopsoas I conducted the following treatments. Points included GV 14, right GB 21, Bai Hui, right BL 18 and right BL 21. During the first acupuncture session, a priority was placed on an enjoyable experience. I avoided directly treating reactive associated iliopsoas muscles/attachment points due to that priority. I elected to place GV 14, right GB 21, and Bai Hui to start centrally at some better tolerated points. GV 14 and GB 21 can also assist with forelimb pain and pathology, whereas Bai Hui can help address pelvic limb pain/sensitivity. Right BL18, was placed to address a trigger point noted on myofascial examination and right BL 21 was placed to target the iliocostalis and longissimus muscles but to avoid the directly sensitive segments associated with the iliopsoas muscle. All needles were well tolerated. Points included GV 14, Bai Hui, right BL 25, right BL 27, right BL 54, right GB 29 (which was reactive & not replaced), GV 20, right ~ BL 24, bilateral BL 23, right BL 52. Needles were stimulated intermittently. Generally, in this treatment I started centrally and moved peripherally. GV 14 and Bai Hui can help address thoracic and pelvic limb pain. GV 20 can help with excitement/agitation through autonomic neuromodulation. These are also good starting central points. BL 25, 23, 24 and 52 can help with back pain; these were also trigger points. BL 27 stimulates the parasympathetic nervous system. GB 29 and BL 54 target hip pain. In retrospect, during the second session I would have placed GB 30 as well to complete the hip triad. During the second acupuncture session, Alanna was more amenable to the treatment and stood still willingly through the myofascial examination. Upon placement of GB 29 on the right side, Alanna reacted strongly and got up. Proposed explanations include possibly hitting a nerve or the increased muscular sensitivity in that area. GB 29 was not replaced but BL 54 was well tolerated. Points included GV 14, Bai Hui. Massage of iliopsoas and associated muscles. evidenced by softening of her eyes and laying down comfortably. 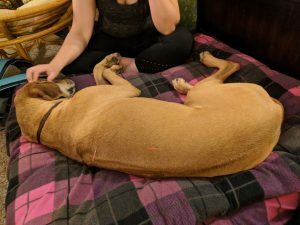 The treatment time was extended to provide the maximal benefit and she was reported to sleep throughout the night by her caretaker. Clinical implications of this case are significant as “thirty-two percent of hind limb muscle strains in dogs involve the iliopsoas muscle groups” . This means that this particular injury is worth taking the time study and address properly. I did not find significant improvement in trigger points or musculoskeletal reactivity throughout my myofascial examinations, but strict rest would have assisted in treatment of potential muscle strain. I also would have performed two treatments a week for the first two-three weeks if time was not a constraint. Finally, I would have liked to laser her iliopsoas muscle to promote healing and circulation as well as electrical stimulation over L4-7 to increase acupuncture effects but did not yet have the mechanical capability at that time. It should be noted that chronic iliopsoas pain can be associated with nearby joints, including hip, stifle or lumbar spine  therefore further workup to rule out associated joint involvement is recommended. The resulting compensation of an involved joint causing unilateral iliopsoas strain would also explain a decreased efficacy in the limited number of treatments performed. Learning points from this case include the benefits of being flexible with the treatment regimen and protocol employed. Treatment for trigger points along Alanna’s bladder line (associated with thoracic vertebrae 9 and 10), as well as her right iliopsoas muscle should be continued and targeted specifically. This can help with hip stability and protect her from injury down the line. 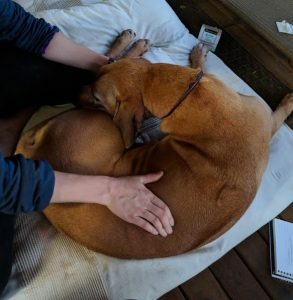 Based on her decreased amenability to acupuncture on the last visit, massage with a few points for parasympathetic stimulation was elected with a different end goal. The secondary goal was extremely successful. This finding helps highlight the fact that muscular and myofascial targets are not the only use for acupuncture and displayed its calming potential clearly to me. The lack of presence of the owner, and the change in disposition from beginning to end of the treatment helped to legitimize the results for me personally. Clinically this suggests that regular acupuncture/massage can be effective for anxiety or stress in some patients. Personally, this means I will be utilizing the first assessment with a new patient to clearly define expectations and ensure that the experience is positive to cultivate those secondary effects. Canapp, S. Non-responsive Hind-limb Lameness in Agility Dogs: Iliopsoas Strains. Veterinary Orthopedic Sports Medicine Group- Clean Run, March 7; pp 1-5. http://www.akcchf.org/assets/files/canine-athlete/Iliopsoas-Tendinopathy-groin-pull.pdf. Accessed May 17, 2018. Cullen R, Canapp D, Dycus D, et al. Clinical Evaluation of Iliopsoas Strain with Findings from Diagnostic Musculoskeletal Ultrasound in Agility Performance Canines- 73 Cases. Veterinary Evidence 2017;2. Available at: https://www.veterinaryevidence.org/index.php/ve/article/view/93/162. Accessed May 17, 2018. Goats GC. Massage- the scientific basis of an ancient are: Part 2. Physiological and therapeutic effects. British Journal of Sports Medicine 1994; 28: 153-156. https://www.ncbi.nlm.nih.gov/pmc/articles/PMC1332056/pdf/brjsmed00015-0011.pdf. Accessed May 23, 2018.